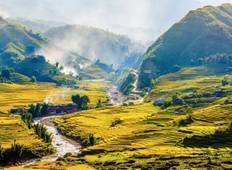 Find the right tour for you through Lai Chau. We've got 7 tours going to Lai Chau, starting from just 7 days in length, and the longest tour is 16 days. The most popular month to go is November, which has the most number of tour departures. "exceptional vietnam cambodia tour for 14 days !!! We've just returned from a 2-week..."
"Yes the rides especially in Vietnam were extremely hilly and long. With an average..."